UPDATTE: This place has closed. If your food adventures have ever been held back by fine-dining prices at celebrity chef restaurants, here's some good news. Guy Savoy at Marina Bay Sands has come up with a daily S$180 TGV menu (its original menus include Elegance S$280 and Prestige S$408). The four-course meal is named after the French high-speed train TGV, and is dedicated to those who would like a gourmet experience under 90 minutes. 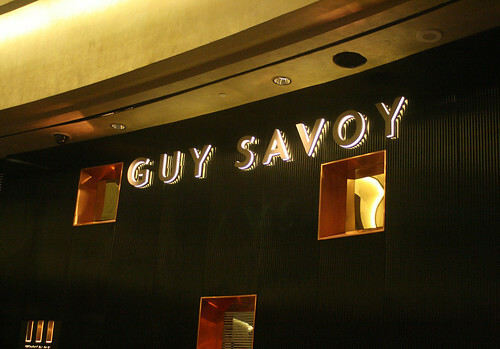 It gives you a chance to try both new and classic dishes from Guy Savoy in a single meal. Well, before I went, I thought this would be a quick post. It's four courses, so maybe four to six photos tops. Boy, was I mistaken! Somehow I ended up with over 20 photos in this bumper post! Because what you're getting is an experience that's a lot more than just the four courses listed on the menu. 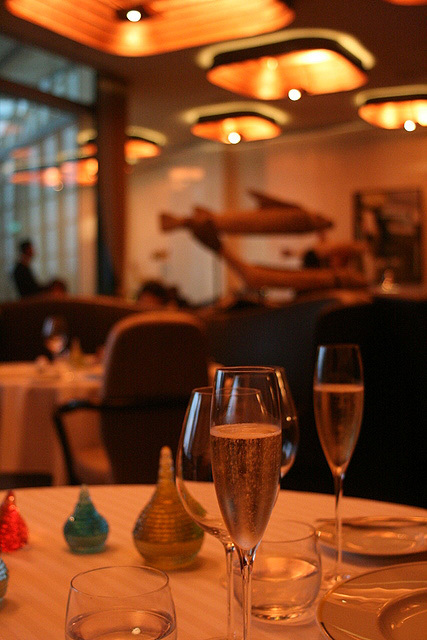 Guy Savoy certainly knows how to delight, right from the beginning. Soon after you are comfortably seated, the waiter comes along with a teaser bite. 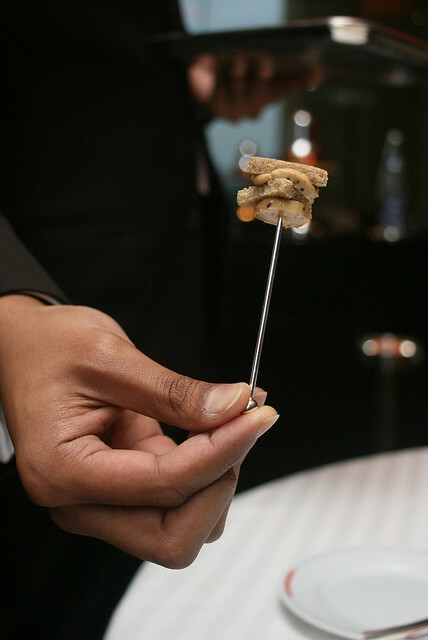 Canapé: Foie gras terrine and truffle vinaigrette with crispy crunchy bread. A fabulous start. 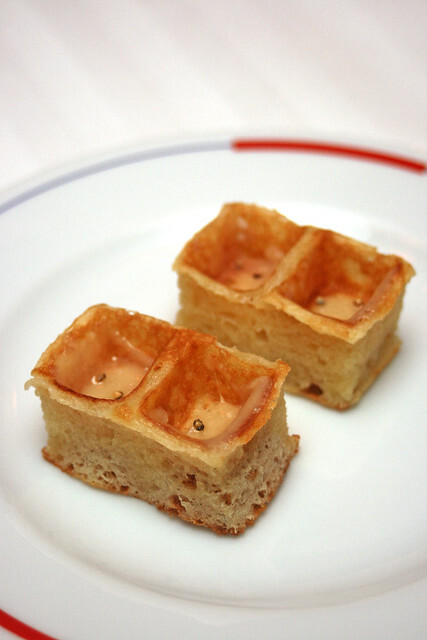 Creamy, full-flavoured foie gras on thin, crisp toast. It's almost cruel to have only one bite. Then another canapé arrives. Toasty warm waffle with parmigiano cheese and black pepper. So simple and yet so good. It's presented on a cocktail stick too, to be eaten fresh and hot, but we put it on a plate for photography. Jamón Ibérico de Bellota Joselito Gran Reserva! OK, this one is NOT included in the TGV menu, but all other guests at Guy Savoy get this luscious leg of ham rolled up to their tableside. It's just too beautiful not to show you. 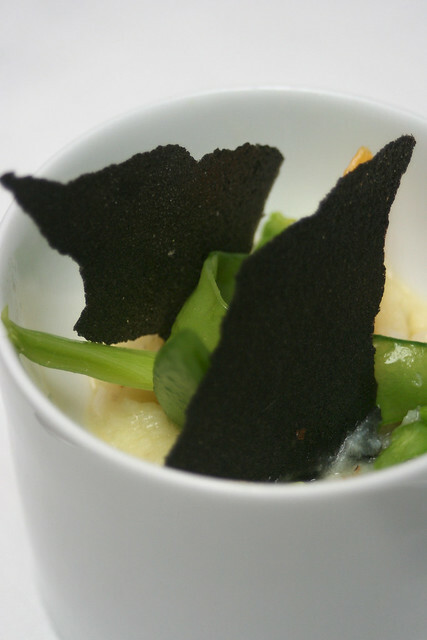 Amuse bouche from the TGV menu. A soup of chilled sunchoke cream with lemon powder, served with arugula puree, sunchoke, green apple, ginger and lemon. You are to sweep that little pile of lemon powder into the soup. Cute bit of interactivity. Sunchoke? It's a tuber that has flowers that look like mini sunflowers. Sometimes called Jerusalem artichokes, but they are not artichokes at all. Tastes like...potato, kinda. But apparently rich in inulin, which has prebiotic properties. 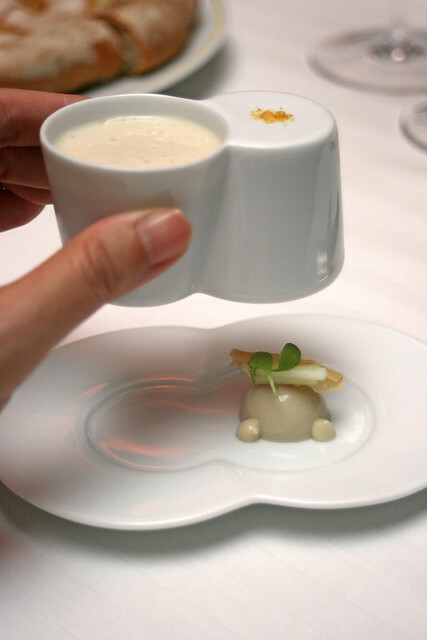 But the soup is not all there is to the amuse bouche. Lift up the cup and discover a sunchoke royale, accompanied by lemon soubise, sunchoke chips, apple and arugula salad! Surprise! And now we come to the first course, which is Brittany oysters in three variations. First as a salad, then one cold and one warm preparation. 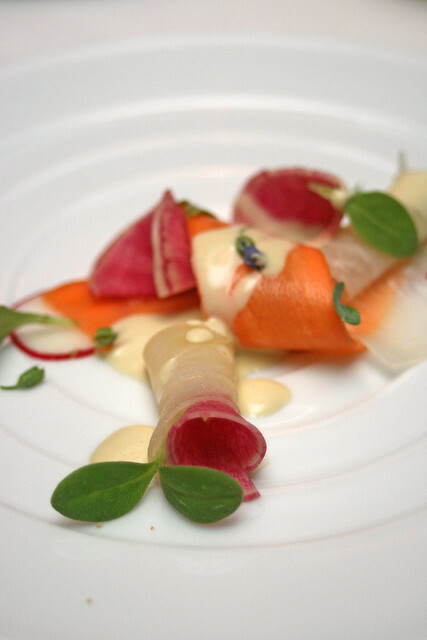 Shaved young vegetables with ocean herbs and oyster vinaigrette, so pretty and bright. The vegetables were very crisp and naturally sweet. 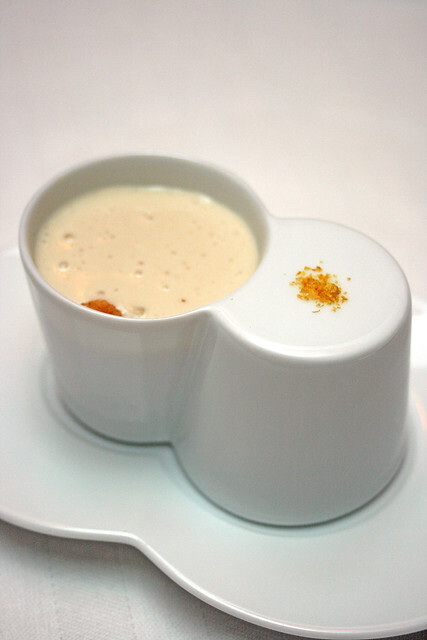 Guy Savoy's signature Oyster in Gelée. I still remember the first time I had this, about half a year back. 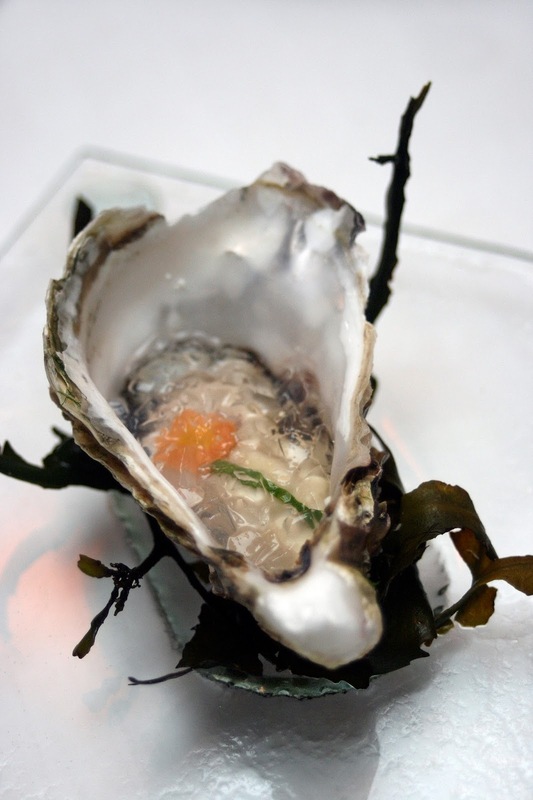 The cold, fresh oyster is topped with iced gelée, but there is a surprise of oyster cream at the bottom, which makes this all go so well together. I remember I swooned a little back then. But at this dinner, something else was even better. The one I liked best out of all the three variations was the warm dish. 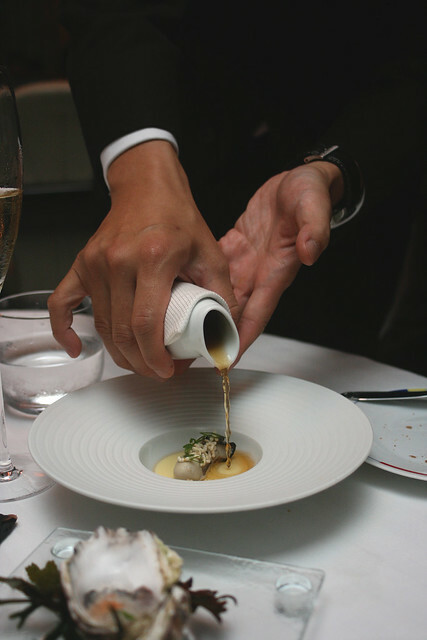 Oyster with a sweet onion royale, crisp rice, and oyster-dashi bouillon. The Japanese touch works like a charm. The whole thing was very light and yet so umami. 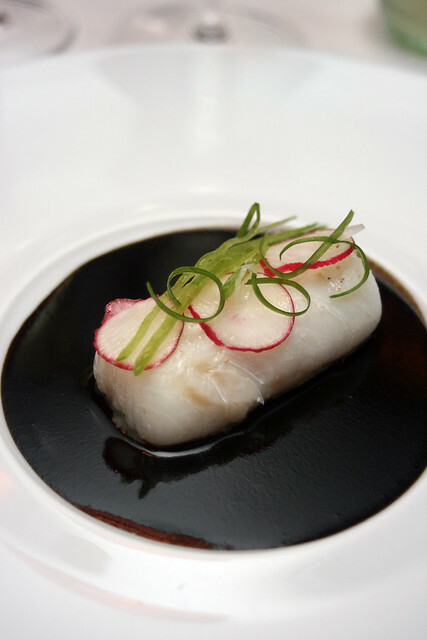 Atlantic cod with Sauce "Poivre Noire" Façon Guy Savoy. This new dish is inspired by Chef Savoy's favourite local dish - black pepper crab! But this cod "étuvée" is more refined than anything I could have imagined for a black pepper cod rendition. This is where his focus on fresh ingredients and clean flavours really come through. The cod is so incredibly soft and smooth, even Chinese restaurants which take pride in perfectly steamed fish will be envious of the texture he's achieved. The thick sauce is a mix of several Asian and Western sauces - dark soy, hoisin, possibly some balsamic vinegar, and of course, black pepper. It isn't a black pepper gravy copy - it is its own creation. The cod came with this little pot - Summer vegetables, cod brandade and black pepper "croustillant". Cod brandade is usually an emulsification of cod, olive oil, garlic, and potatoes, cream or milk. This one tastes like the most beautiful mashed potatoes ever. You will be spoiled by the lovely breads! The French are such masters at bread-making. 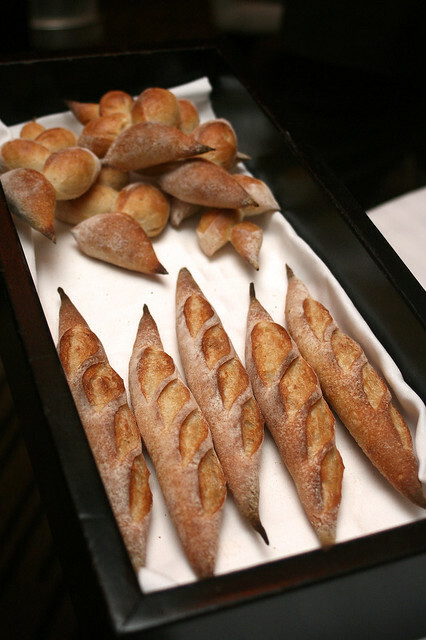 The pain d'epi and mini baguettes are so crisp and warm, we had a few each. They also served us a full fougasse (see first photo) at the start. At your table you will find salted and unsalted butter, fleur de sel, and cracked black pepper from Sarawak (all in colourful glass containers) to enjoy. Good butter really makes a big difference. 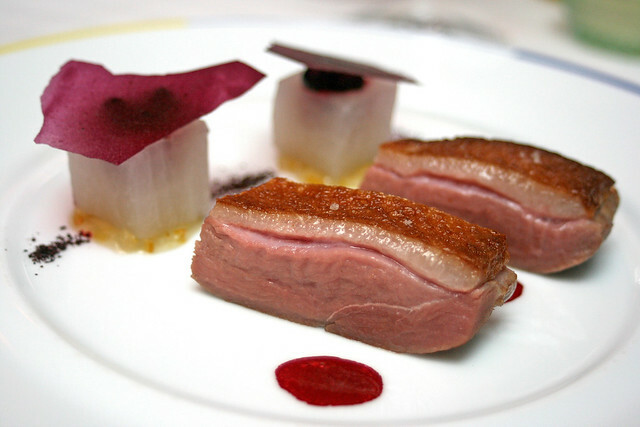 Pan-seared duck breast with black currants, turnip and yuzu. The duck is very moist and tender; it tastes like it's been done sous-vide style. 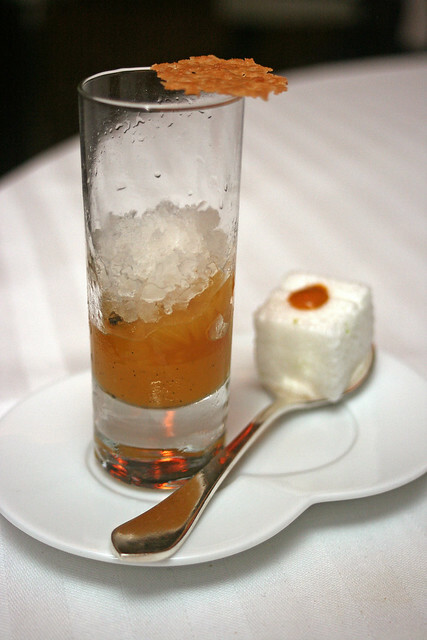 Dessert Amuse - Mango gelée; marinated pineapple with passionfruit syrup, coconut tuile, and lime coco granité. A delightful palate cleanser before your dessert. See the little white cube on the spoon? You'll know why it's called "Floating Island" once you bite into it. It's the softest egg white marshmallow ever, and filled with delicious caramel. A "wow" moment on its own. Now for the full dessert. Tea-infused milk chocolate "finger" raspberry sorbet. 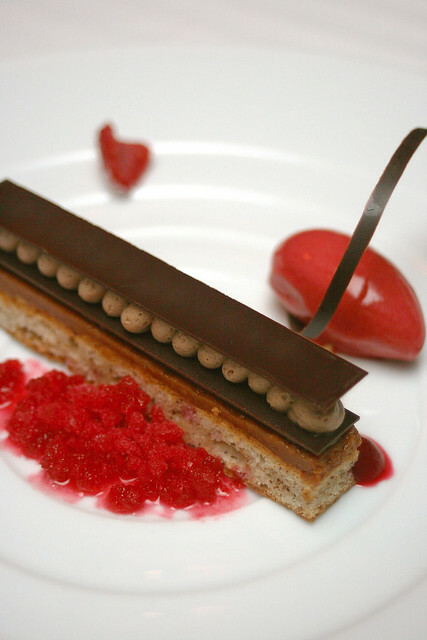 This is a pleasing concoction of hazelnut dacqouise with praline feuilleté, raspberries jam and Jivara tea, milk chocolate mousse, rasperries sorbet and granité. The tangy raspberries cut through the richness of the chocolate, and there are contrasting textures of creamy and crunchy. And after your dessert, you get....more dessert! 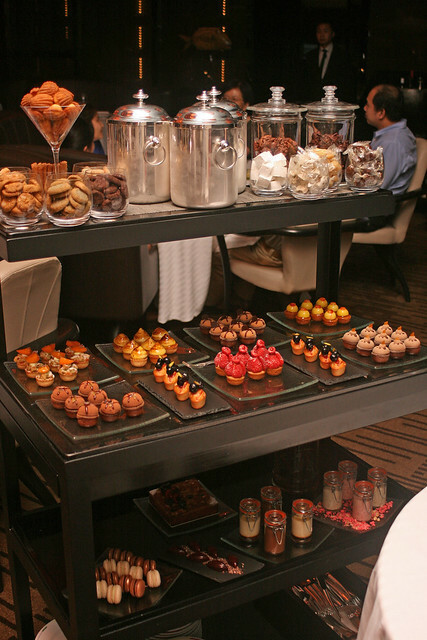 Guy Savoy's trolley of exquisite mignardises. How it lights up every diner's face when this is rolled up to their table. Miniature tarts, macarons, meringues, madeleines, ice creams, puddings, candy, biscuits, cookies, cakes...take your pick, anything you like. The sad thing is, most of us would be pretty full at this juncture, so we can at most manage a petit four portion. I would love to come back just for this! My selection from the dessert trolley. 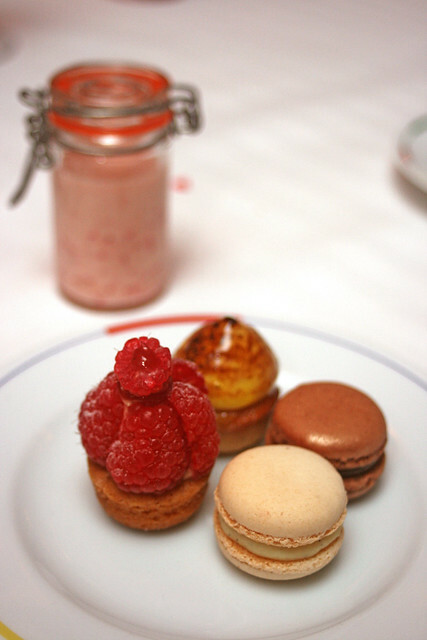 Beautiful raspberry tart, a peach confection, and some of the best macarons I've ever had. In the background, a rose-flavoured rice pudding. 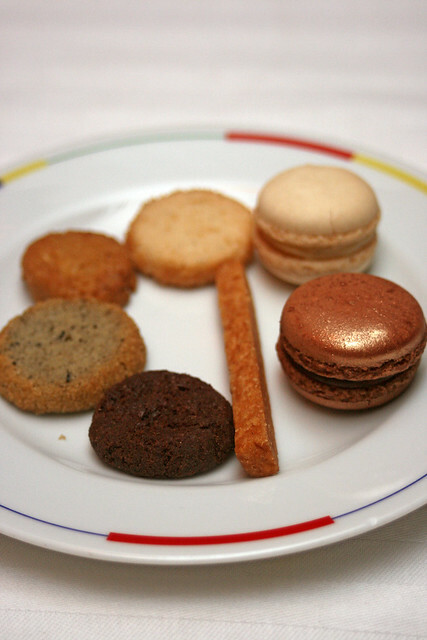 My friend's selection of cookies and macarons. Everything is so good! 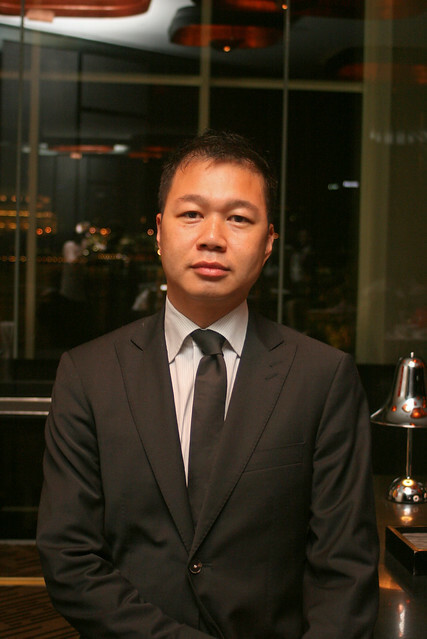 General Manager Georges Tov is the one who came up with the TGV menu, after taking into consideration feedback from customers who wondered why French fine-dining was so expensive. The restaurant did not want to compromise on quality of ingredients, but with this menu, it could offer a taste of Guy Savoy's new and classic dishes, but within a more affordable bracket. We were intrigued to find a Teochew guy heading the restaurant, but he's not local. Georges is from Paris, where he spent more than 30 years. His heavy French accent is as real as it gets. Service was decent. The wait staff are cheerful, polite and discreet, gliding to your assistance as soon as you need it. Sommeliers are on hand to help you pair your food with wines. By the way, there is a dress code here: formal elegant. We brought business jackets to be safe, but we saw people in shirts and jeans. 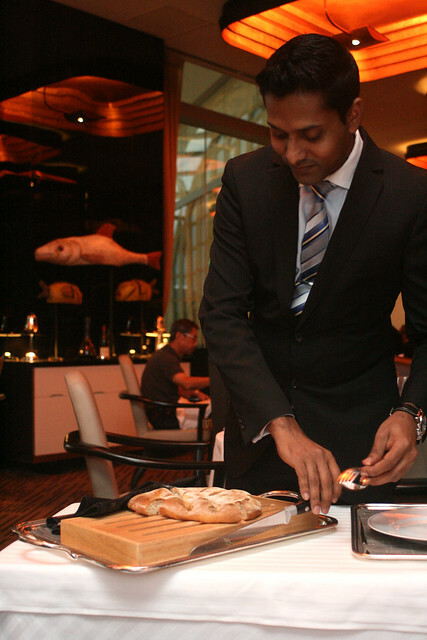 It's hard to get people to dress up for fine-dining in Singapore, isn't it? I blame the weather. Well, the TGV menu certainly makes dining at Guy Savoy a bit more accessible. Of course, you can enjoy it beyond 90 minutes, or even under it, if you are in a hurry. Just let them know. Personally, if I was going to such a fine-dining establishment, I would want to savour it slowly! I'll leave you with a beautiful film on Guy Savoy's website. Told not in words but via music. Go see it. Thanks to Marina Bay Sands for the invitation, and Guy Savoy for the lovely dinner. This isn't just an ordinary post about food. It is a work of art itself, with luscious photos, delectable descriptions, and a wonderfully paced narrative that invites you to partake in this culinary adventure par none. 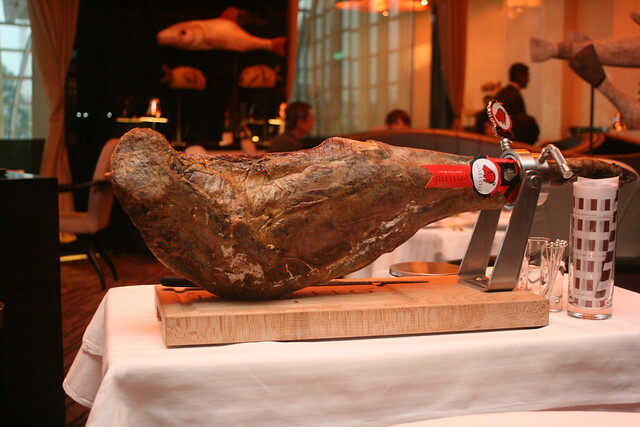 Incidentally, my family tried that Spanish leg of ham before whereby they merely shave a few precious slices for you, rolling the leg to your table. My son loved it and wanted more, but we told him that we need to budget ourselves. Oh, thank you so much, Walter! This post did take a lot longer to craft than I expected, but all worth it in the end! 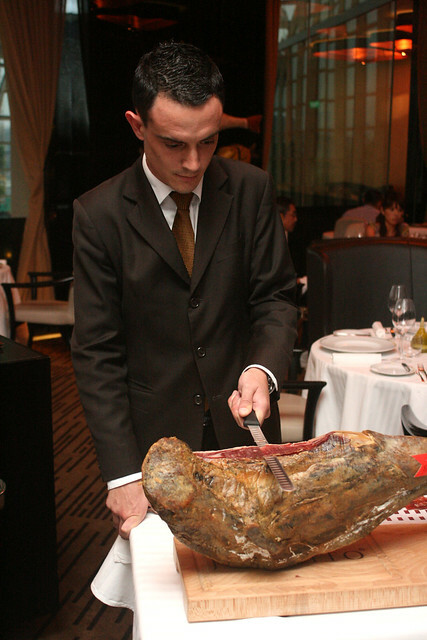 And psst, the same Jamon Iberico is available at Toque! Your son can enjoy some at home too! What a post! Despite the price, your post makes me want to visit this place now! Feeling hungry! WHOA! i would like to come here in Oct , when I am in town.. but er.. alone! haha (you know what i mean la:P ) excellent selection.. i am swept away by the interactive aspect of it all.. nice! It's a tasteful concoction of various tastes. The menu has an extensive list of different choices.